Children from ethnic minorities are more likely to be living in poverty in Britain than white children, according to a new report. Around a third of all children in Britain are living in poverty, but for Bangladeshi and Pakistani children the figure is 73%. The report, by Child Poverty Action Group found 63% of black African children and 40% of Caribbean children live in poverty - where family income is less than 60% of the national average. 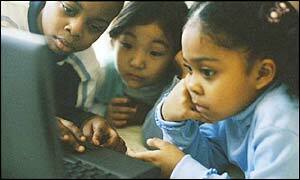 The group concluded that children from ethnic minorities are disadvantaged by discrimination and racism. "The causes of poverty are complex, but there is strong evidence that discrimination and racism towards ethnic minorities continues to contribute to the risk of living in poverty," said director Martin Barnes. "Discrimination creates unequal opportunities and unequal outcomes." Shadow work and pensions minister Oliver Heald said he supported the call for more research into the problem. He suggested that one of the reasons for the inequality was that people from minority ethnic groups faced particular hurdles when claiming benefits. "One of the main reasons why Labour failed to meet its pledge to lift over one million children out of poverty during the last Parliament is low benefit take-up," he said. 75% of Indians are in full time education at age 18 compared with 42% of the population as a whole. How poor is poor in modern Britain?